I'm guessing that almost everyone has had at least one of these halloweens where you don't know what to wear and you don't want to go as a cat or a witch again for halloween, but you want to create one super quickly and easily but still want to look cute? Yeah that was my conundrum this halloween, so I compiled 3 quick and easy DIY halloween costumes! To create this look you will need a plain white top. To measure where the sprinkles should go I tried the top on with the skirt and placed the sizing sticker which came with the top to where the skirt starts on top, so I have an idea of where I shouldn't put sprinkles. Grab different coloured pieces of paper, preferably 5 of each colour. You can go for any colours but this is what I chose. As you can see I cut each colour into multiple strips and then cut the strips down to different rectangle sizes. To get a sense of what they were going to look like I placed them onto the top just to see how I wanted the design to look like. With one piece of paper grab your hot glue gun and do only a line of glue in the middle of the rectangle. Then place it down onto the top, do this with every piece of paper placed on the t-shir. Note that the glue will make the t-shirt's insides stick together but that is easily fixable by just separating the two fabrics with your hands. For the head piece you will need one green (normal sized) pipe cleaner, one headband and one giant pipe cleaner. If can't find a red one what I did as I had a pink one I used hair spray and sprayed it red and let it dry. Wrapped the red pipe cleaner once around the headband, used hot glue to keep it attached to the headband then made it into a ball and rapped the bottom of the green pipe cleaner around a bit of the red pipe cleaner then hot glue it in place. Create a leaf with the middle of the green pipe cleaner and your done! Pair these two items with a camel colour skirt and some camel coloured shoes then your halloween costume is complete! 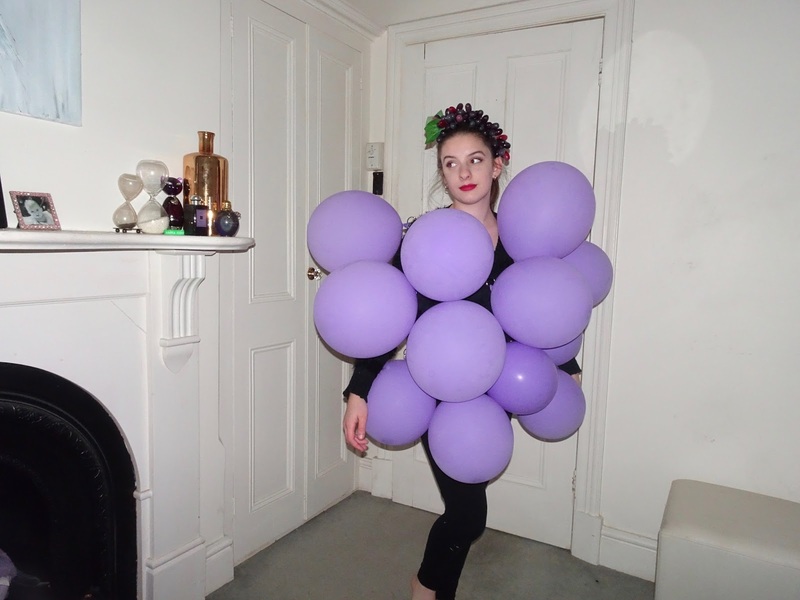 To create the head piece start off by having a bunch of fake grapes, pull off one whole side of grapes from the bunch. 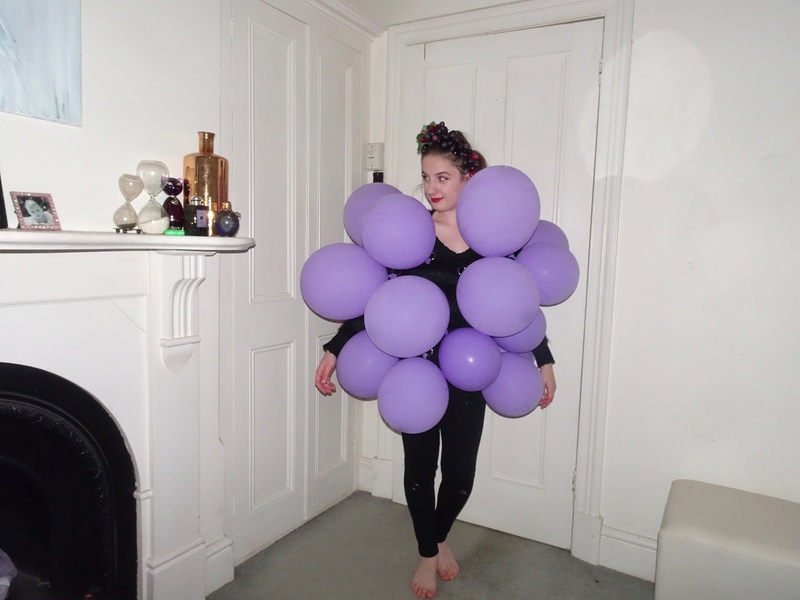 Grab a random colour pipe cleaner and cut it four times and loop both the headband and a stem of the grapes and tie them together. To fully secure them into place, using a hot glue gun glue both the headband and the pipe cleaners together. 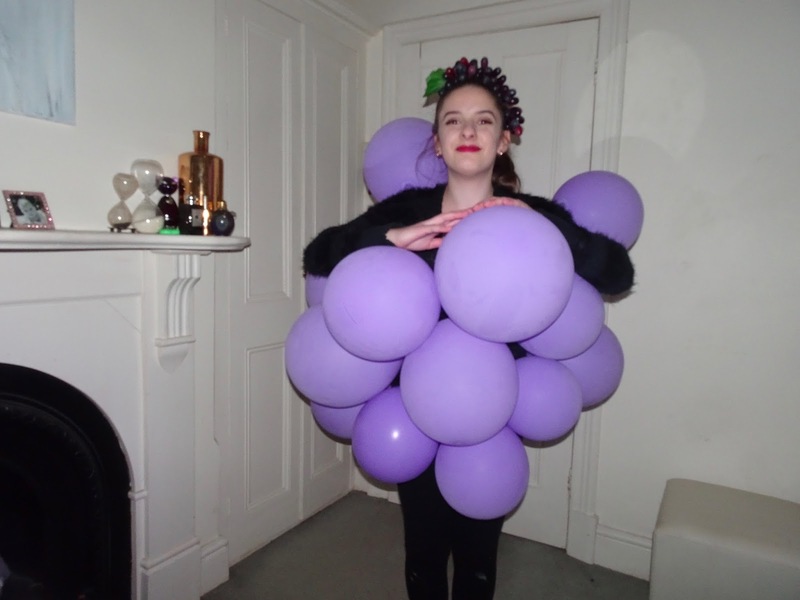 To finish the look get a jumper and purple balloons, blow them up to different sizes and using safety pins or a key chain, or I guess anything you can find, attach the balloons onto your jumper. There you go, you are now actually something you eat! Crack 15 different coloured glow sticks. Use 6 out of the 15 glow sticks and place them onto old black leggings. Once your happy with how they look sticky tape them to the leggings. Using another 6 glow sticks place them onto a black top. Then stick them down using sticky tape. To finish this super easy costume, grab three glow sticks attach all of them together and loop one through a bit of your hair (this requires your hair to be up). This is what it should look like in day light. And this is what it looks like at night. I hope you enjoyed these super easy and quick DIY halloween costumes, I surprised myself how easy and quick these were especially the last one, the stick figure! If you decide to wear one of these costumes tag me on Instagram or tweet me a picture, I'd love to see it! WOW WOW WOW very very very creative and easy too!! !